We recently wrote about The Value of SEO Campaigns, and how you may want to consider starting a SEO campaign if you want an edge on your competition. After all, approximately 60% of search engine users click on a link that is listed on the first page. Meaning, unless your site is listed near the top of the search results, your chances of generating traffic and business are significantly less than your competitors. So, how can you stand out among the competition and improve your ranking with SEO? The answer is keywords. From an Internet user (or consumer) perspective, keywords are the terms and phrases entered into a search engine to find information. For example, a consumer might enter “specialty landscaping Austin” (known as a keyphrase) into Google to find a local landscaping service. From a web developer (or business owner) perspective, keywords are the terms and phrases implemented throughout a website and utilized in an SEO campaign to help the search engine crawlers find a website. 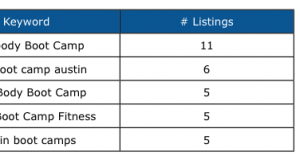 Basically, properly implementing keywords helps to make sure that when users search “specialty landscaping Austin,” your website related to that subject appears high in the search results list. The keywords you decide to use for your campaign do not appear out of nowhere. A strong keyword list is built from keyword research. The first step in keyword research is understanding your audience. Who do you want to find your website? People in different audience segments may perform searches in different ways. For example, if your website is a database of job openings for engineers, you will want to take into consideration that job applicants and employers will be searching different terms, i.e. “engineering job listings” vs. “post engineering jobs.” Another aspect of keyword research involves understanding your competition. What keywords does your competition rank highly for? How can you tailor keywords, or make keywords more specific to separate yourself from the competition. Finally, it’s also useful to evaluate the search volume of the keywords you are considering. Are your proposed keywords actually being searched for? Are there atleast more than 50 searches a month? Your research will help you build a strong list of keywords. Keywords tailored to your audience(s), keywords that help you set your website apart from the competition, and keywords that are actually being searched by users. The keyword research phase of your SEO campaign is on-going, and the success of your SEO campaign depends greatly on monitoring successful keywords, and removing unsuccessful keywords from your list. Your keyword list is dynamic. Once it is created, it should be updated to reflect changes in the SEO campaign. Thanks for sharing your thoughts on austin seo websites.